At the start of the series in both manga and anime, Sakura is the princess of the Kingdom of Clow who has feelings for Syaoran, her childhood friend. When she is about to confess her feelings, a mysterious force causes her own dormant magical powers to manifest in the form of feathered wings. When her feathers are scattered across time and space, Syaoran vows to recover all of them because each feather represents a memory Sakura has had since birth and are connected to her heart; without the feathers, she will die. Fei-Wong Reed (the mysterious villain in the series) reflects on the ability of people like the High Priest Yukito, Princess Tomoyo of Nihon, and Yūko to cross dimensions and comments that the power concealed within Sakura and the ruins in Clow Country surpasses them all. In order to cross dimensions, Sakura must pay Yūko the thing most important to her and she pays Yūko in an indirect way but her price is pretty much the same as Syaoran - her memories of him. When she awakes in the Hanshin Republic the first person she sees is Syaoran, but she does not remember anything about him, asking "Who are you?" At times, such as in Ōuto, Sakura comes extremely close to remembering Syaoran but it is quickly erased once more from her memory. Syaoran, having known this would happen previously, will never tell her anything about their previous relationship. At most, all Sakura knows about Syaoran is what she has relearned from the adventures together with Mokona, Fai, and Kurogane, although she knows she knew him previously and he was very important to her. It is also clear that she is falling in love with him once more. Sakura possesses unnaturally good luck; both Chun Hyang and Yūko call her "a favored daughter of the gods". This is what allowed her to travel dimensions safely until Yūko asks for her good luck as a price. According to Yukito and Syaoran, Sakura also has the ability to "hear" the voices of those who cannot be heard, such as spirits of nature, and to see ghosts. Such as the time in the Country of Jade, she can see Princess Emeraude while others couldn't. She can also see the future in visions, though this ability is unreliable and nothing she has control over. Sakura's personality is passive and weary, exhausted from her loss of memories. However as the series goes on, she becomes more stronger and independent. Syaoran states, even though she's lost most of her memories, she'll never change. She helps the group whenever she can, whether it's washing dishes or saving their lives. 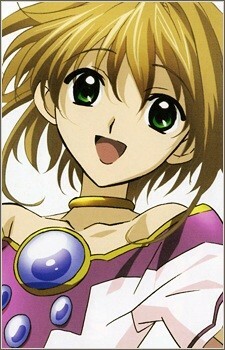 However, later in the manga, her personality undergoes a change after the clone Syaoran leaves her. As she voices to Fai, no matter how identical the two Syaorans may be, the real Syaoran is still not the one she knows. Subsequent chapters show Sakura with a much darker personality, accompanied with gothic clothing. In the Infinity Arc, the group spent a few months fighting in a tournament, supposedly wanting to use the prize money to restore a world the clone Syaoran destroyed. However, the truth is that she was after the real prize - a robot (who is identical to Freya from Chobits) who can let one person and one person alone travel across dimensions. It is later revealed that Fai is under a curse that forces him to kill if he ever meets a person that is stronger than him. And in volume one, you can see that Yūko was not hit by the rain, nor did she touch any of the people directly; this was because she was in another dimension to prevent Fai's curse from being activated. But when Sakura receives two feathers in the Infinity Arc, she was made stronger than Fai's halved magic and so he stabbed her, seemingly possessed. Sakura had a vision that after killing her, he would go insane and kill everyone else, eventually committing suicide, but she used the robot to transport her soul to a dream world, thus saving herself and stopping Fai from going insane. Later, it's revealed that she was not the original target of the curse, as the real Syaoran was. This is explained further in her appearance in xxxHolic; she changed the future so that Syaoran would not be killed. As she explains to Watanuki (Xxxholic chapter 140), her coldness to the real Syaoran was because she was trying to follow the dream as close as possible up to that near fatal event. It's later learned that Sakura can still be saved. The two places where her body and her soul went contains two feathers. Her soul went to the world of dreams, where it will be aided by the other Syaoran. So the real Syaoran, Fai, Mokona and Kurogane went to Celes Country to rescue the body of Sakura, as Yūko told them it's the body they should rescue first, then the soul. At the end of the manga, her soul is eventually killed by the clone Syaoran, but just before her death, she reveals that she is a clone of the real Sakura. Her purpose was to map out other dimensions for Fei Wang, who created her, by finding the feathers. She is reincarnated in the original Sakura's body in the past, with her memories intact by Yūko, along with the clone Syaoran. In this life she is friends with Hikaru, Umi, and Fuu, of the Magic Knights. Syaoran and Sakura eventually meet and give birth to a boy, who turns out to be the original Syaoran. They raise him until it is time for him to begin the events of the series, and then they are sealed in a glass tube in order to await the time where Reed attempts to shatter reality. Sakura and Syaoran, after breaking free from the tube, cleanse the feathers, but both ultimately disappear after Kurogane kills Fei Wong, leaving behind only a feather which Sakura's original absorbs.